In 1971, Rosie was captured from the wild and imported to the United States. She lived in several Florida facilities during her early years. She moved to the Zoo in Jackson, Mississippi, in 1977 at the age of six years. Juno, an African female, joined her at the Zoo in 1982. Rosie and Juno lived together at the Jackson Zoo until 2010, when they were transferred to the Nashville Zoo at Grassmere. At the Nashville Zoo, they joined Hadari and Sukari. Juno died in the spring of 2015. 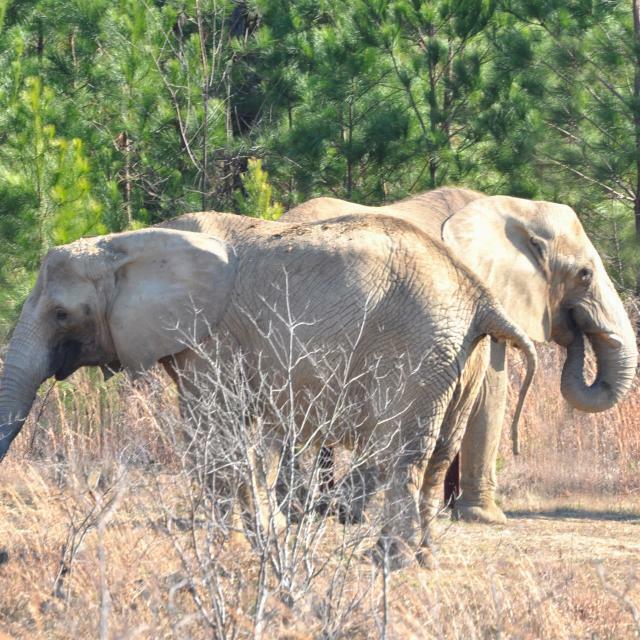 Hadari, Sukari, and Rosie were retired to The Elephant Sanctuary in the fall of 2015. 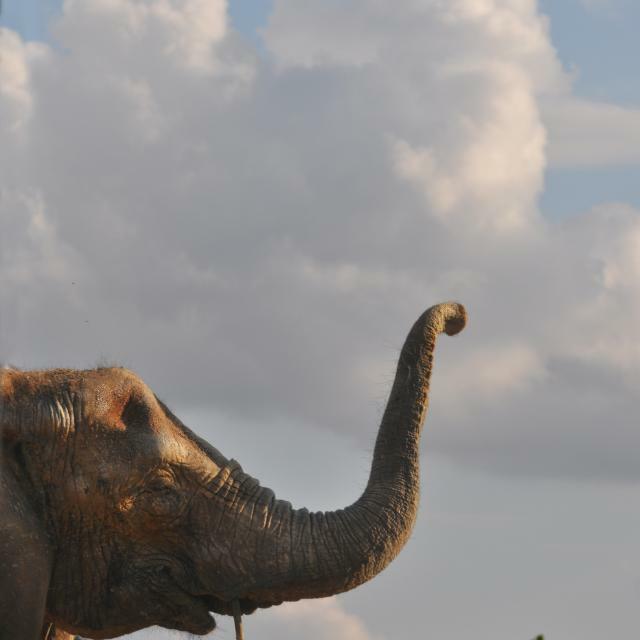 Rosie became the 27th resident retired to The Elephant Sanctuary. The smallest African elephant at The Sanctuary, Rosie's trunk was both narrow and short. Unlike most African elephants, Rosie did not have tusks. She was easily identified by her crooked tail that resembles the handle of a coffee mug and two circular holes in her right ear. Rosie often wagged her tail back and forth like a dog and her mouth was upturned on either side so that it looked like she was always smiling. Rosie spent five years at the Nashville Zoo with Sukari and Hadari. At The Sanctuary, Rosie shared space daily with Sukari. The duo napped together at night, spent time side by side, and walked around the yard together during the day. Rosie is the more dominant elephant, and she frequently displayed her dominance over Sukari in a variety of ways. She most often displaced Sukari if food, hay, or browse was left in their shared space. Introductions to sharing space with Tange began in the summer of 2016. Rosie arrived at The Sanctuary with chronic joint and health issues. Her needs were the greatest within the African herd, and The Sanctuary Husbandry Staff were continually inventing new strategies to improve her quality of life. Two feet of sand were added to her stall inside the heated Africa barn to provide further comfort for Rosie's feet and joints. Almost as if to signal her approval, Rosie was soon lying down to sleep, something she had reportedly not done in over 10 years. The Sanctuary's Facilities Staff also created small mounds of dirt in Rosie's Annex Yard in with the hope that the climbing of the miniature hills would help Rosie build muscle. In one year at The Sanctuary, Rosie’s strength and flexibility increased dramatically. She was observed traveling down into the habitat’s small valleys and back up again with relative ease—exploring all of the large habitat areas—and wallowing in the mud with her closest companion, Sukari. 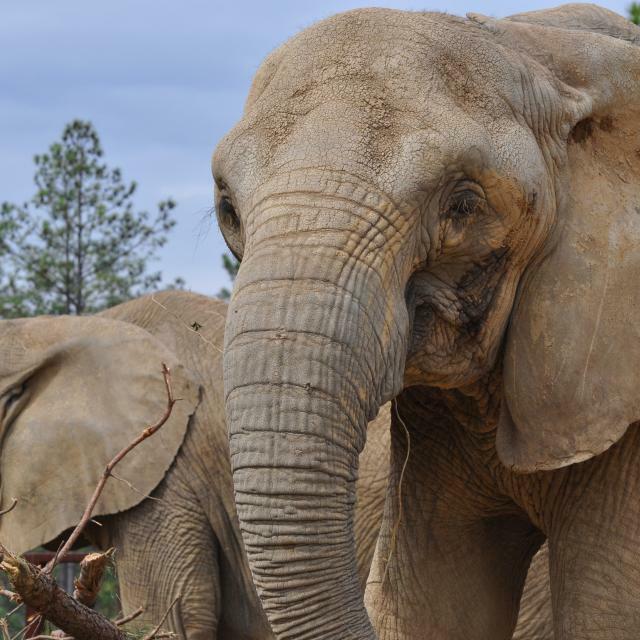 Rosie was described as a small elephant with a big personality and a great curiosity for The Sanctuary's expanded natural habitat space, which she enjoyed in her final year. In early December, 2016 Rosie began exhibiting signs of increasing discomfort. On Thursday, December 29, Rosie fell and could not get up on her own. Care Staff were able to assist her to stand. She was continually monitored by Veterinary and Husbandry Staff who noted a visible decline in overall health and her ability to remain standing, even with assistance. Due to decreasing quality of life, the decision was made to humanely euthanize. Rosie passed peacefully on Saturday, December 31, 2016 surrounded by those who loved her. Sukari and Tange were nearby and given an opportunity to visit her body. 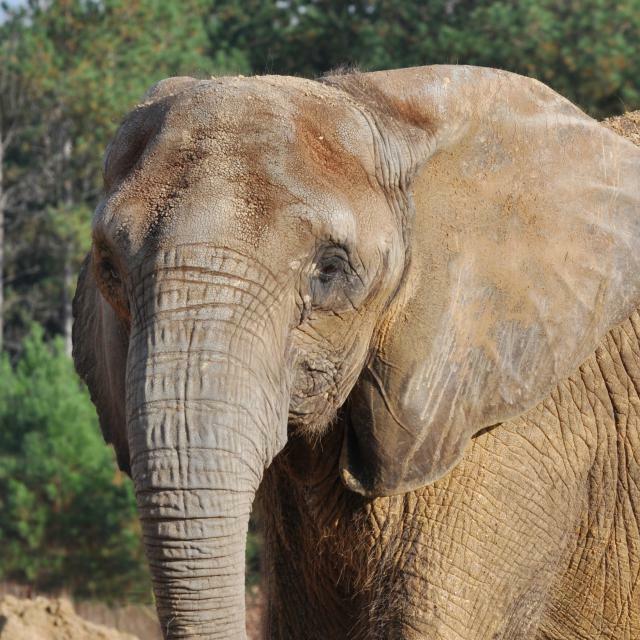 The Sanctuary is honored to have had the opportunity to give Rosie her final home during her time with us. To leave a written tribute to Rosie, visit her Tribute Page. Most significant findings at necropsy were chronic musculoskeletal lesions, including multiple fractures 6-10 years old of the right humerus that resulted in severe reduction in range of motion and ability to bear weight naturally. Abnormal bone formed by an old fracture resulted in a new fracture in her shoulder, which prevented her from standing comfortably. Other findings included severe chronic osteoarthritis and pododermatitis (foot disease) and mild cardiac disease.